A graduate of Syracuse University, Stuart earned his law degree from New York Law School. Stuart is admitted to practice before the New Jersey and New York State Bars. Stuart began practicing law in 1991. In 1995, along with his partner, Scott Sherman, he founded Minion & Sherman. 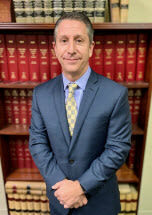 Stuart is a member of the New Jersey State Bar Association, as well as both the Essex and Passaic County Bar Associations. He previously sat on the Essex County Ethics Committee, as an appointee of the Supreme Court of New Jersey's Office of Attorney Ethics. This committee is charged with investigating ethics claims levied against attorneys by both laypeople and fellow members of the Bar. Stuart volunteers with the Family Courts of Essex and Passaic Counties Early Settlement Panels, helping parties to resolve their divorce cases amicably and fairly, avoiding both escalating costs and rancor. He is also a participant in the Lawyer Referral Services of both counties. In addition to this post, Stu also volunteers his services to the Essex County Bar Association's Ask A Lawyer program and Project Law, an initiative of the Rudy and Linda Slucker NCJW Center for Women, both of which provide free legal counseling to members of the public.